Rio 2016 Olympics: Ikegami to deploy 8K OB production unit. Maywood, NJ / Rio de Janeiro, August 2016: Ikegami, a leader in HD and UHD cameras and production equipment for TV broadcasters, will take part in pioneering 8K coverage of the Rio 2016 Olympic Games. The Summer Games will take place August 5-21st in Rio de Janeiro, Brazil. Ikegami will be onsite throughout the Summer Games with the world's first 8K Outside Broadcast (OB) production vehicle, which was completed in September 2015. This groundbreaking mobile unit is designed to operate as a complete mobile 8K broadcast production facility, capable of producing unsurpassed picture quality complete with 22.2 channel surround sound. Ikegami’s 8K OB vehicle delivers extremely high quality and reliability in a compact footprint, and is capable of worldwide operation. 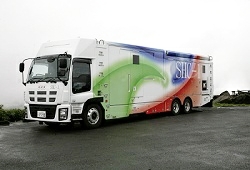 The OB vehicle will support Ikegami's 4th-generation UHDTV cameras, the SHK-810 developed in cooperation with Japan Broadcasting Corporation (NHK). The SHK-810 stands as the world's first 8K ultra HD field camera system and employs a single 33 million-pixel Super 35 CMOS sensor, achieving 4,000TVL horizontal and vertical resolution. The SHK-810 is 90% smaller in size and weight compared with the 1st generation camera, with significantly improved operability. "The Olympics represent the ultimate in passion, excellence and achievement," says Hiroshi Akiyama, Marketing Division Deputy Director of Ikegami. "Ikegami's commitment to these principles is highlighted by our extensive 8K presence in Rio at the 2016 Olympic Games. We are excited to give many global viewers their first experience of 8K with our brilliant team and leading technology."